HAVE REPORTERS BECOME POLI-TICKS- THE MEDIA PARASITES OF THE BODY POLITIC? Whenever I start to believe there is no rhyme or reason to anything I experience in my daily life, serendipity pops up its coincidental head and throws me for a loop. 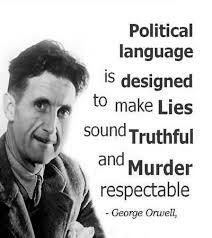 I mean at first examination, what does fundraising at national public radio station KPCC have to do with George Orwell of 1984 fame and an essay he wrote entitled Politics and the English Language? In Orwell's essay, he clearly describes how "political speech and writing are largely the defense of the indefensible." What occurred to me is that the only thing that has changed since he originally published this essay in 1946 is that those in the government and the media have only become more adept at obfuscating reality. Thank G-d for an occasional Ed Snowden to let us know what time it is. While I am not surprised about the self-deceptive and predictable rhetoric of the delusional right in this country, what is now giving them a run for their money is the disingenuous platitude-ridden rhetoric of the left that has purposefully blinded itself to an incessant move to the right. If one dares to question why liberals no longer posit programs that have in the past implemented traditional liberal values like equal access and opportunity, peace, and equality before the law, one is accused of being negative and a pessimist for an unwillingness to live in wonderland. As NPR station KPCC was in its fundraising mode last week, for me there was a clear disconnect between what those hawking for donations on behalf of the station said and the reality of the stenographer status that KPPC reporters have come to practice on a daily basis to the exclusion of any real reporting. Like state-run media in the old Soviet Union, our media, both mainstream and public, never deviate from a clearly defined corporate party line. And with the consolidation of media by five or six corporations and the dependence of public media on subsidies from foundations with their own political agenda picking up these stations shortfall in light of cuts in their federal budget, those interested in keeping their jobs fall all over themselves to keep it light and breezy. In listening to the incessant optimism of those trying to get me to support KPCC, I found their picture of this "best of all possible worlds" to be in marked opposition with what my own senses were telling me as to what's really going on. It wasn't true that KPCC reporters "left no stone unturned" in reporting a story. Although they have far greater access to what is going on, they merely parrot what they are told in complete contradiction of their claim that "we're here for you." Reporter Sharon McNary of KPCC once told me straight out, "We will never report what you want us to report about LAUSD, because the Broad Foundation supports Superintendent Deasy at LAUSD...and Broad supports us." The revolving door that we all have become used to over the years in government, where those charged with regulating business, wind up cashing in by going to work for the same businesses they were supposed to regulated has now become a phenomenon infecting 1st Amendment freedom of the press, where Reporter Barbara Jones of the syndicated Daily News, who supposedly covered LAUSD for 6 years, now takes a job with LAUSD Board Member Tamar Galatzan. Is this her paid day for having played softball with LAUSD over the last 6 years? During the Vietnam War era I remember demonstrating against the war and then going home and seeing in depth coverage of the issues that finally brought an end to the war. More recently, a veteran reporter like Helen Thomas who dared to question this country's unquestioning support of Israel is drummed out of her post at the White House. So now, if a tree falls in the forest, one is free to assert that it didn't, because nobody heard it. But with Twitter, Facebook, Linked In, and other monosyllabic means of expression, one must also wonder how much longer we will be able to sequence together enough facts to even understand what is going on. Cada vez que empiezo a creer que no hay rima o razón a todo lo que experimenté en mi vida diaria , serendipia aparece su cabeza mera coincidencia y me lanza un bucle. Me refiero al primer examen , ¿qué hace la recaudación de fondos en la estación de radio pública nacional KPCC tiene que ver con George Orwell de 1984 la fama y un ensayo que escribió titulado Política y el idioma Inglés ? En el ensayo de Orwell, que describe claramente cómo " el discurso político y la escritura son ante todo una defensa de lo indefendible ". Lo que se me ocurrió es que la única cosa que ha cambiado desde que se publicó originalmente este ensayo en 1946 es que quienes están en el gobierno y los medios de comunicación se ha convertido solamente más adeptos a ofuscar la realidad. Gracias Dios por un ocasional Ed Snowden para hacernos saber qué hora es . Aunque no estoy sorprendido por la retórica de autoengaño y predecible de la derecha delirante en este país, lo que ahora se les da un plazo para su dinero es la retórica perogrullada plagada sincero por parte de la izquierda, que a propósito ha cegado a sí mismo un movimiento incesante a la derecha . Si uno se atreve a cuestionar por qué los liberales programas ya no se plantean que en el pasado han implementado los valores liberales tradicionales, como la igualdad de acceso y de oportunidades , la paz y la igualdad ante la ley, uno es acusado de ser negativo y pesimista de una falta de voluntad para vivir en país de las maravillas . Como emisora ​​NPR KPCC estaba en su modo de recaudación de fondos la semana pasada , para mí no era una clara desconexión entre lo que los pregonando donaciones en nombre de la estación dijo y la realidad de la situación taquígrafo que los reporteros KPPC han venido a practicar a diario para con exclusión de cualquier información real. Al igual que los medios de comunicación estatales de la antigua Unión Soviética , nuestros medios de comunicación , tanto en la corriente principal y pública , nunca desviarse de una línea política claramente definida. Y con la consolidación de los medios de comunicación por cinco o seis corporaciones y la dependencia de los medios de comunicación públicos de los subsidios de fundaciones con su propia agenda política recogiendo estas estaciones de déficit a la luz de los recortes en el presupuesto federal , los interesados ​​en mantener sus puestos de trabajo caen todo ellos mismos para mantenerlo luminoso y alegre . Al escuchar el optimismo incesante de los que tratan de conseguir que yo apoyo KPCC , encontré una foto de este " mejor de los mundos posibles" para estar en la oposición marcada con lo que mis sentidos me decían en cuanto a lo que realmente está pasando . No era cierto que los reporteros KPCC " dejado piedra sin mover " en un reportaje . Aunque tienen un acceso mucho mayor a lo que está pasando , se limitan a repetir como loros lo que les dicen en completa contradicción con su afirmación de que " estamos aquí para usted. " Periodista Sharon McNary de KPCC una vez me dijo directamente : " Nunca vamos a informar de lo que usted quiere que nosotros informamos sobre LAUSD , porque la Broad Foundation apoya Superintendente Deasy al LAUSD ... y Broad nos apoya . " La puerta giratoria que todos nos hemos acostumbrado a lo largo de los años en el gobierno , en donde los encargados del negocio regulación , terminan por sacar provecho de ir a trabajar por las mismas empresas que se suponía debían regulado ahora se ha convertido en un fenómeno que infecta primero Enmienda libertad de la prensa, donde Reportero Barbara Jones del sindicado Daily News, que supuestamente cubrió LAUSD durante 6 años, ahora tiene un trabajo con el LAUSD miembro de la Junta Tamar Galatzan . ¿Es este su día pagó por haber jugado softbol con el LAUSD en los últimos 6 años? Durante la época de la Guerra de Vietnam Recuerdo manifestarse contra la guerra y luego ir a casa y ver a su cobertura a fondo de los temas que finalmente pusieron fin a la guerra. Más recientemente , un periodista veterano como Helen Thomas que se atrevió a cuestionar el apoyo incondicional de este país de Israel se tamborileó de su cargo en la Casa Blanca. Así que ahora, si un árbol cae en el bosque , uno es libre de afirmar que no lo hizo, porque nadie lo oyó. Pero con Twitter , Facebook, Linked In , y otros medios de expresión monosilábicas , hay que también se preguntan cuánto tiempo más vamos a ser capaces de secuenciar juntos suficientes hechos para entender siquiera lo que está pasando . You may be old as the ocean, but your words convey wisdom that enlightened our minds. And I agree with you that we must confront the liars because "Truth is beauty, beauty truth..."
What a wonderful analysis of the media, a subject which I cover, posting links and writing on the subject. In my classroom for the last wonderful years with brilliant young minds, we discussed 1984 and Animal Farm, even as we examined the media. I introduced them to Marshall Mcluhan, Vance Packard and Jerry Mander. You really are the greater fool. You did see this... if not watch! it is 2 minutes long. You talk on FM stereo to an audience that hears in the static of AM! Your mind and the clarity of your insight is beyond ordinary folks... which is why 'THEY' (the puppet-masters, the cartel, or whatever name for the 1/10 of 1% who are pulling the strings) are so successful at broadcasting blarney and utter lies, that they confuse an already ignorant public about EVERYTHING!!!!. I expect you, and the other bright teacher-activists that I know, will keep trying to be heard, until the utter uselessness of fighting becomes clear! You know that this very minute, the democrats are aware that the Koch Bros are spending 10 times what the dems have available, in order to buy the elections and ensure that a one-party government replaces our democracy. In several states ,despite the Supreme Cour ruling, tough proof of citizenship is being required, and the voter registration days and voting hours have been changed in all places where such inconvenience makes it impossbile for working folks to vote...especially black and latino who tend to vote for democrats. These plutocrats have as their final goal -- the control of the education system, the court system, the propaganda technology, the military, police and covert services and finally the Congress, Supreme Court and Executive offices; but their immediate plan, is to confuse, obsfucate all issues, as--at the same time-- they stress the people. or if the population has no opportunity for earning a living (like in Egypt when there was no HOPE for employment of the population of mostly young men), or if you create financial chaose in a country where savings have evaporated, owning a home is off the table and ordinary people face choices between rent, food and health care! They know they you can selllies ESPECIALLY IF THE PUBLIC SCHOOLS PRODUCE A POPULATION UNAWARE OF HISTORY AND UNABLE TO THINK CRITICALLY (ANALYZE), even as the airwaves are filled with circuses like the Malaysian plane, the olympics, football, celebs and violence. I know I am in danger of implying that a 'conspiracy' exists, but then -- it really sounds like a plan to me, and since I am older and more exhausted from the decades long struggle to reveal the truth and to confront the liars, I rely on young ones like YOU (...hee, hee), to keep talking truth to power, and I will post it and try to keep the conversation going... which is what writers do.